Brown Capuchin Monkey is from South America with a white upper torso and head, with distinctive black arms and a black cap on the head. 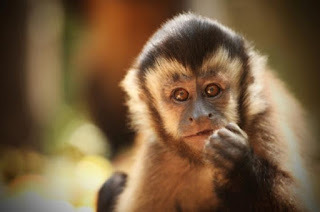 One of the most intelligent monkeys, they are highly trainable and hence their frequent appearances in Hollywood movies. They are arboreal animals spending most of their time on trees. During the day they forage for food, which, in the wild, would include nuts, fruits, berries and leaves, but also insects, bird eggs and small vertebrates. Brown Capuchin monkeys living near water can also feed on crabs, often cracking shells with rocks. In some regions they have become rare due to the destruction of their habitat.